Need something special for your mom, wife, girl friend, or some other special lady in your life? Want to give a gift that is both practical and meaningful? 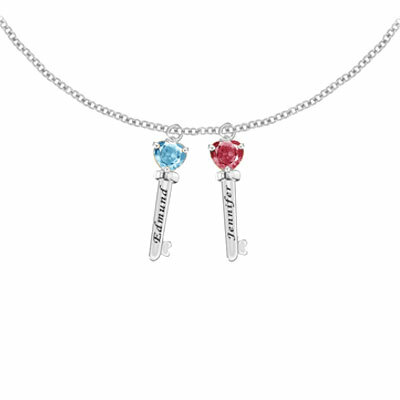 Then the Engraved Family Key Pendant Necklace with 2 CZ Gemstones might be exactly what you are looking for. Fashioned from fine sterling silver and featuring personalization options that include name and birthstone, these pendants are great for necklaces. Two charms can hang beautifully off the chain and keep loved ones close to your heart at all times. The value and craftsmanship of these pendants is unsurpassed and they make a truly unique and wonderful gift for any special occasion. Names can be up to 10 characters per name including numbers and keyboard symbols. Pendant comes with an 18" chain. We guarantee our Engraved Family Key Pendant Necklace with 2 CZ Gemstones in Sterling Silver to be high quality, authentic jewelry, as described above.